It is a small to medium-size evergreen tree typically 14-20 m tall, rarely to 27 m tall, with a narrow conic crown. The bark on young trees is smooth, grey, and with resin blisters (which tend to spray when ruptured), becoming rough and fissured or scaly on old trees. The leaves are flat needle-like, 1.5-3 cm long, dark green above often with a small patch of stomata near the tip, and two white stomatal bands below, and a slightly notched tip. They are arranged spirally on the shoot, but with the leaf bases twisted to appear in two more-or-less horizontal rows. The cones are erect, 4-8 cm long, dark purple, ripening brown and disintegrating to release the winged seeds in September. Vanderwolf's Pyramid Pine is dense, broad pyramidal in youth; becoming a low, broad, flat topped tree at maturity. The pine needles are silvery bluish green and very attractive. 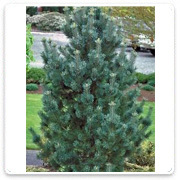 Distinctive, pyramid shaped pine with long, twisted, silvery, blue-green needles displayed on dense branches. 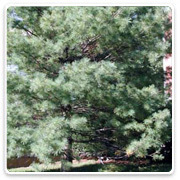 A superior selection for lawn specimen, accent tree or windbreak. Resistant to insects and disease. Evergreen. Full sun. Slow grower to 20 to 25 feet tall, 10 to 15 feet wide, larger with age. 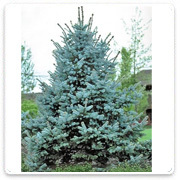 ‘Fat Albert’, 10'-15'T x 8'-12'W, instead of the larger ‘Colorado Blue’ spruce. 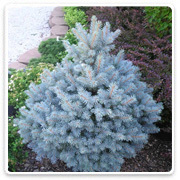 This spruce provides that desired foliage color for a smaller space. 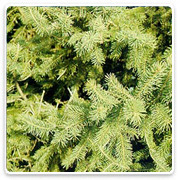 White Spruce is a densely pyramidal evergreen conifer. The needles are dusty green to blue green in color. 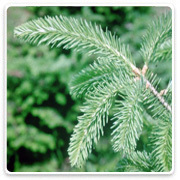 This spruce is quite adaptable to difficult conditions such as heat, cold and drought. It can be used as a single specimen or in groups and can also be used for hedges or windbreaks. Among Western conifer connoisseurs, this more recently selected Colorado Blue Spruce grafted cultivar is considered a top notch performer. It has a beautifully symmetrical growth habit, extremely blue needle color and excellent performance in challenging planting sites. ‘Sester’s Dwarf’ makes a superb specimen giving its yard a “big tree” feel in a small space. Dwarf growth rate; expect the tree to grow 4-6” annually. 15’ x 6’ wide. Zones 3-8.